An Ubud wedding is unlike any other. With sweeping views of Ubud’s lush ravines and some of Bali’s finest sunsets, it’ll seal the deal in creating memories for a lifetime. 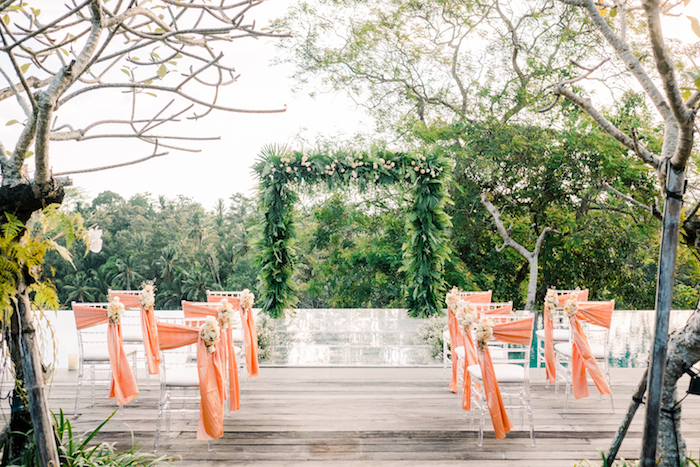 Elegantly set on top of one of the best pools in the world (read more on Mr. Porter) and surrounded by the spectacular Ubud lush verdure and hilly silhouettes, our team will create a gorgeous setting for one of the most important days of your life. With 80 seated guests in beautifully decorated round tables of eight people for the wedding reception, we will help to ensure that every detail of your wedding is just as you dreamed. Forest Pool Wedding ceremony capacity up to 100 guests with 40 seated guests. Send us a message of specific requests, we'll sort them out perfectly just for you. The stunning lush garden rooftop with breath-taking views of Ubud rice fields and some of Bali's glorious sunsets provide a magical setting for smaller intimate celebrations and wedding receptions up to 80 seated guests in romantic long tables set up. Our team can take care of every detail, including food, wine, music, flowers, table settings and marquees. Both civil and religious ceremony or blessing can be held at the property. Garden Rooftop Wedding ceremony capacity up to 80 guests with 20 seated guests. Our award-winning rooftop restaurant, Copper, has thoughtfully designed a 4-course menu for your wedding reception. Send us a message of specific requests, we'll sort them out perfectly just for you. Dinner reception package includes the house tables, chairs, linens, and dinnerware.